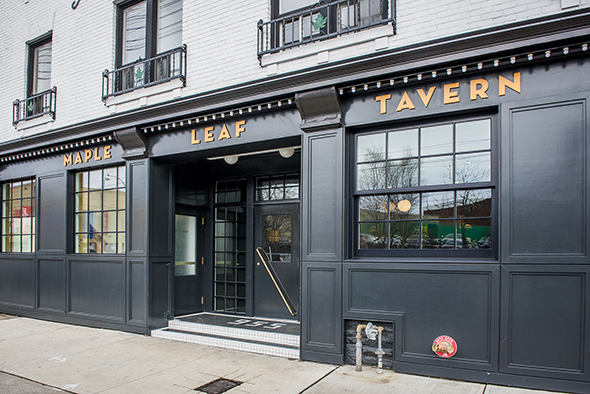 Maple Leaf Tavern is an old bar with a contemporary finish. 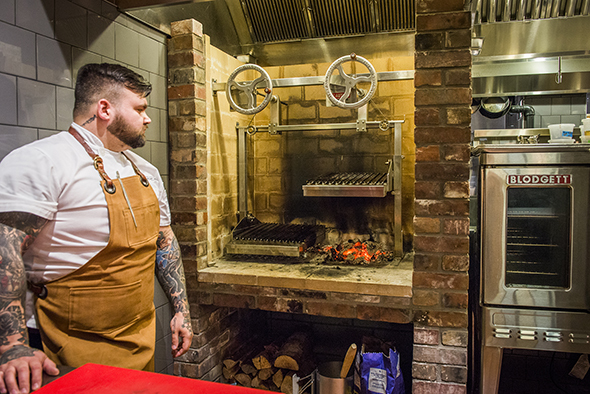 The formerly dilapidated east side institution is an approachable (albeit pricey) 130 seat North American tavern with a wood fire grill at its heart. 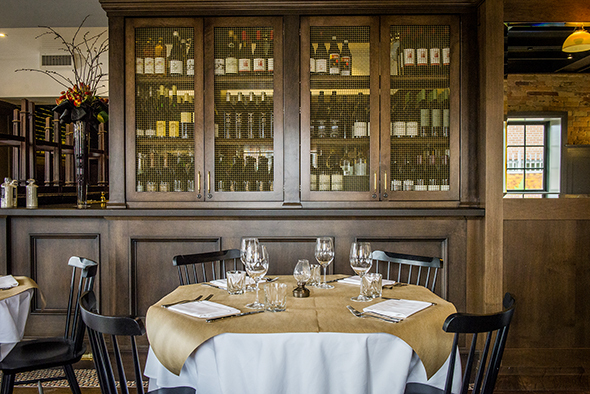 Owner Todd Morgan of Port Restaurant in Pickering has modernized the space with the ambition of preserving its heritage and making it feel like this is how the place could have looked if it was kept up over the years. The original signage adorns the patio, while the stained glass that once decorated the facade has been brought inside and now frames the open kitchen. 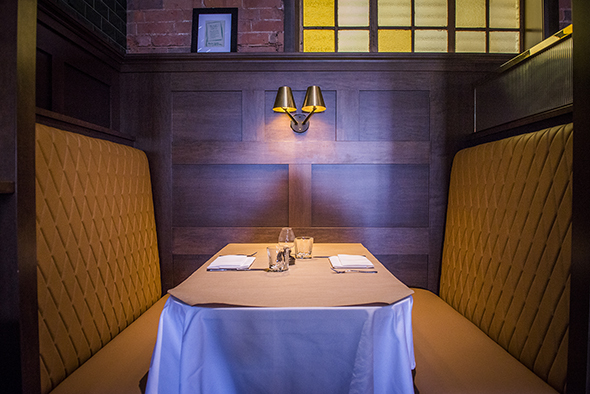 Deep booths, brass light fixtures, and plenty of custom millwork can be spotted throughout. 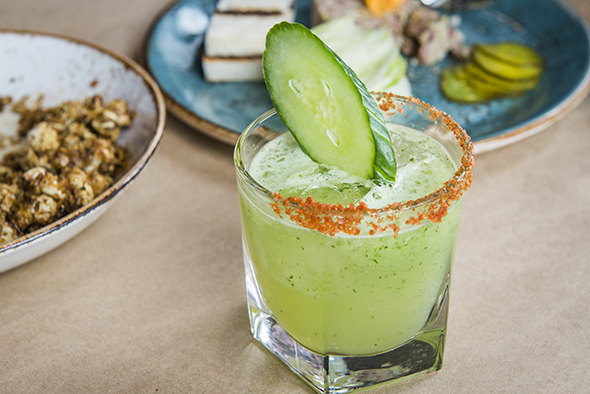 At the central bar, signature cocktails designed by New York's Naren Young include the Stealth Margarita ($13), a blend of Tequila Avion, Briotett Fleur de Surau, cucumber and lime with a jalapeno tincture. 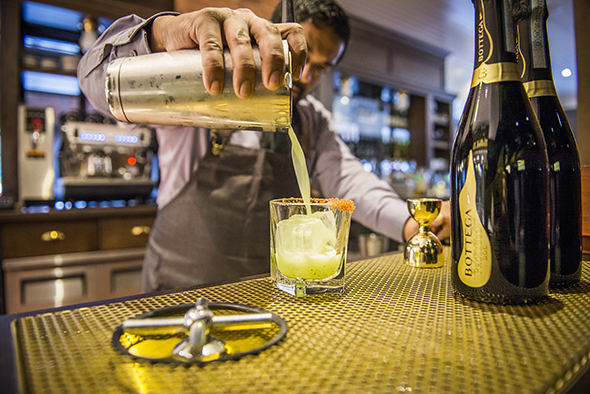 Rounding out the selection, you'll find a short wine list and rotating lineup of beers on tap as well as large format bottles. 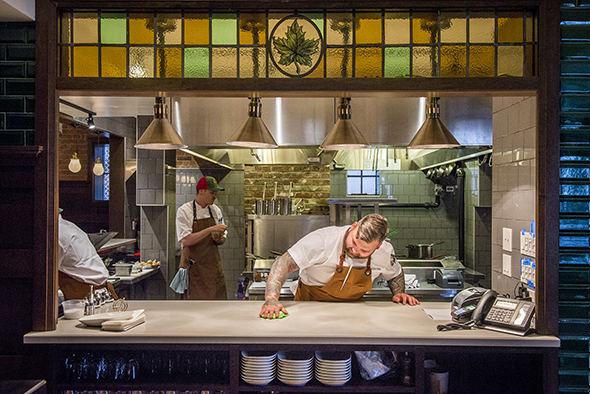 The menu from chef Jesse Vallins (ex The Saint Tavern ) opens with bar snacks. Nibbles like pickled pepperoni ($5), warm olives ($6) and bread and butter ($5) join selections like oysters and grilled shrimp cocktails ($3.50 per piece, minimum three per order) plus house-made sausages ($6 per piece). 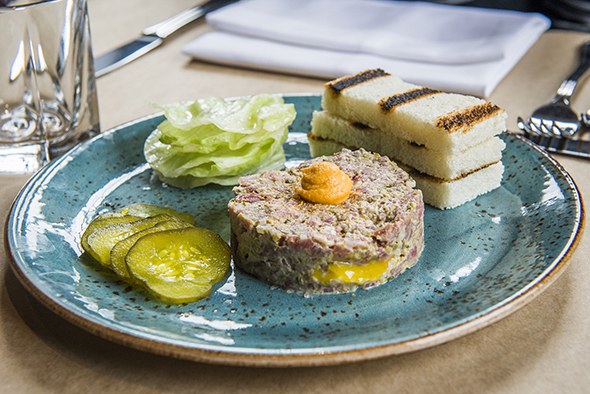 More substantial starters include the steak tartare ($18), a classic presentation served with grilled bread, rounds of iceberg and a dollop of hot sauce to finish. Cutting into it reveals a delightful surprise, a salt-cured egg yolk that isn't runny but adds a little richness amidst the acidic pops of flavours from capers and gherkins that speck the chopped raw meat. 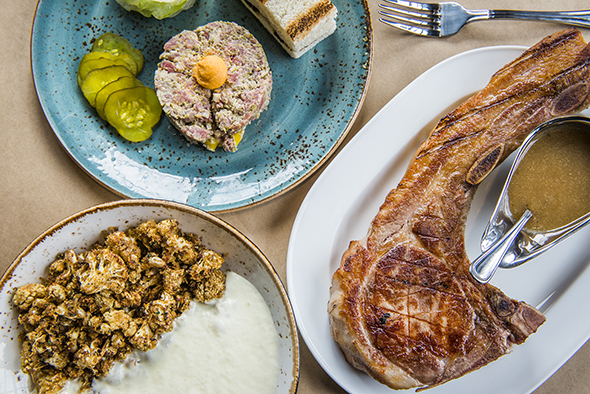 From the wood burning grill are shareable options like the ribeye with red wine sauce ($36), mutton chops with hot mustard ($29) and whole fish with beurre blanc ($28). The Tomahawk pork chop ($48) is a particularly stunning 24 oz. slab of meat on the bone complemented by rosemary applesauce. In steakhouse style, the meaty mains are served solo and a lineup of accompaniments including hasselback potatoes ($13), creamed spinach ($9) and honey and cumin glazed carrots ($9), can be ordered on the side. All the options sound tempting, but the roasted cauliflower ($9) is easy to love at first bite. 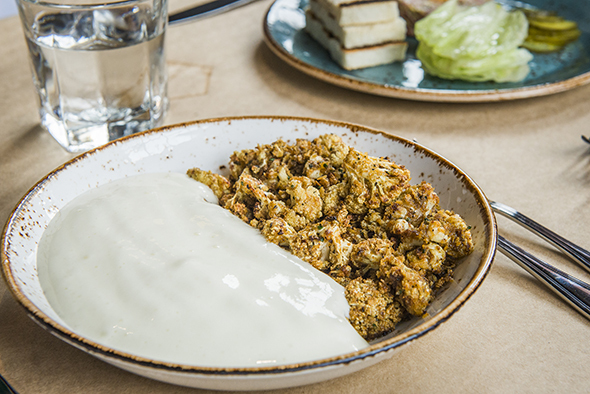 The dish is divided into halves and one one side is piled with florets in a peppery herbed bread crumb topping while the opposing side is filled in with a cheddar emulsion. It's essentially an airy cheese sauce that when eaten together offers gratin-esque flavours. The menu will change with the seasons, while lunch and brunch services will be a welcome addition to the neighbourhood's options for daytime dining.